The Speech Enterprise Solutions division of RSI provides companies with complete voice technology solutions across a wide range of vertical markets, which include Financial, Telecommunication, Government, Retail and Life Sciences verticals. SES practice provides Business Intelligence Tools for Administration, Monitoring, Management, Reporting and Analytics for Voice Platforms and Applications. SES also provides professional services such as speech prototyping, voice application migration, system installation and integration, technical training and solutions tuning. 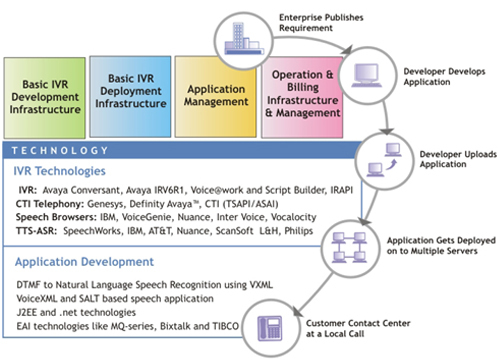 RSI's Speech Solutions help enterprise customers deploy new speech-based services and port legacy IVR and non-speech enabled applications to the VoiceXML/SALT platforms. Using our “SmartSourcing” delivery model, which blends On-Site, Offsite and Offshore resources with industry specific knowledge, we can help you realize a 30-40% cost saving on your existing IVR infrastructure investment. These savings reflect in a higher ROI. Move from proprietary to open-standards IVR. 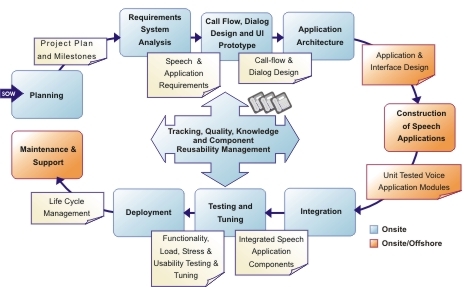 Custom develop Speech (VoiceXML, NLU) and DTMF applications rapidly. Cut development costs using our offshore application development resources. Improve customer satisfaction by reducing on-hold time and enhancing caller experience. Voice enable your enterprise applications with minimal effort. Reduce your IVR maintenance and management costs significantly. Application Development RSI has extensive experience in developing IVR applications ranging from DTMF to Natural Language Speech Recognition using VXML. To its advantage, RSI has an ISO 9001-2015 and CMM Level 4 Offshore Center of Excellence to deliver cost-effective solutions. Whether you are looking for business case development, design consultation, mentoring, temporary development resources or outsourcing, our speech team equipped with state of the art infrastructure is ready to address your needs. Let us know how we may begin helping you. Please do contact us via email or call us at +1 609 409 3636 ext 123. Our team of Speech Scientists and Voice User Interface Design specialists will work with you to apply complex dialog designs for delivering an engaging customer experience. RSI's IVR services leverage on the IVR management product suite and ready to use re-usable components to provide integrated IVR solutions. Our staff is proficient in cutting edge tools and platforms available in the market. Experience in implementing solutions across diversified industry segments sets us apart from our competitors. Best of breed partnership with industry leaders in voice technology such as Avaya, SpeechWorks, Audium, Voicegenie and IBM, enable us to offer integrated solutions to our customers. Considering our customer’s precious time and to justify the ROI, all projects are designed with fixed timescales, however, utmost care is taken to preserve the functionality. Change is often the reason for delays in application development. RSI’s RAD methodology combats scope and requirements creep by limiting the project's exposure to change -- optimizing the development cycle and limiting the cost of change by incorporating it up-front before large investments are made in development and testing. To increase the ROI, we adhere to a step by step process as listed below. We provide the customer with a end to end effective and an excellent quality solution.